Apartament Rynek 5/11C, Lublin in Lublin is an apartment building. Apartament Rynek 5/11C, Lublin offers accommodation in Lublin, 700 metres from Czartoryski Palace and 800 metres from Sobieski Family Palace. The property features city views and is 1.1 km from Krakowskie Przedmieście Street. The apartment includes 1 bedroom, 1 bathroom, a seating area, and a kitchen. A flat-screen TV with satellite channels is available. Speaking English, Polish and Russian at the 24-hour front desk, staff are always at hand to help. Hiking can be enjoyed nearby. Lublin Interna...tional Fairs is 2.8 km from Apartament Rynek 5/11C, Lublin, while Lake Zemborzycki is 10 km from the property. The nearest airport is Lublin Airport, 12 km from the accommodation. Apartament Rynek 5/11C, Lublin offers accommodation in Lublin, 700 metres from Czartoryski Palace and 800 metres from Sobieski Family Palace. The prop...erty features city views and is 1.1 km from Krakowskie Przedmieście Street. The apartment includes 1 bedroom, 1 bathroom, a seating area, and a kitchen. A flat-screen TV with satellite channels is available. Speaking English, Polish and Russian at the 24-hour front desk, staff are always at hand to help. Hiking can be enjoyed nearby. Lublin International Fairs is 2.8 km from Apartament Rynek 5/11C, Lublin, while Lake Zemborzycki is 10 km from the property. The nearest airport is Lublin Airport, 12 km from the accommodation. 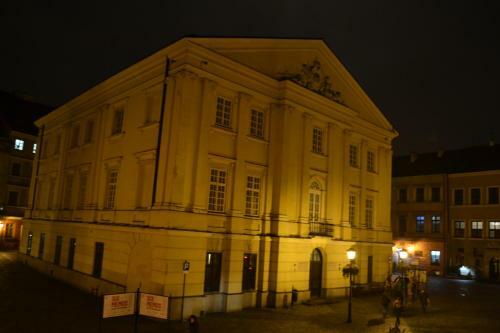 When would you like to stay at Apartament Rynek 5/11C, Lublin? This property will not accommodate hen, stag or similar parties. Please inform Apartament Rynek 5/11C, Lublin in advance of your expected arrival time. You can use the Special Requests box when booking, or contact the property directly with the contact details provided in your confirmation.